A river surrounded by limestone cliffs rising out of the rice fields. 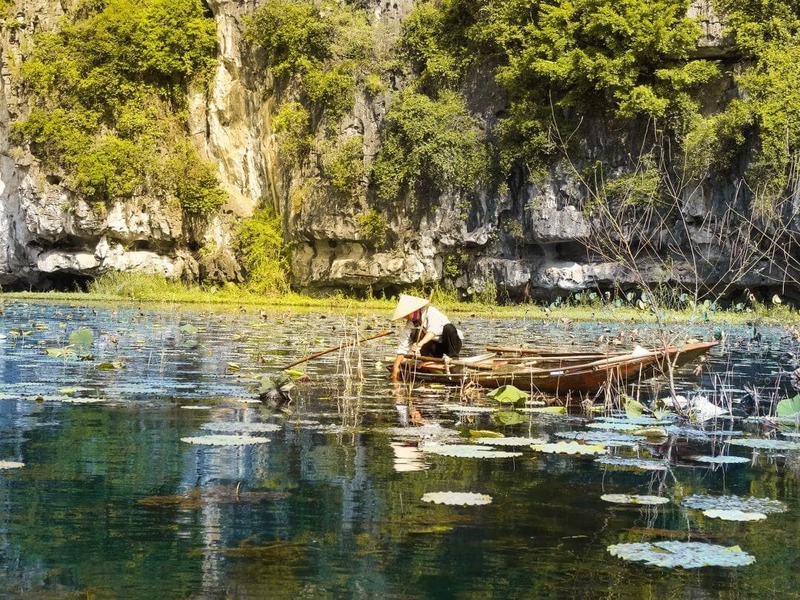 Tam Coc is often compared to Halong Bay on the dry and probably Vietnam’s most underrated destination. The Tam Coc river is definitely as beautiful as Halong Bay. This UNESCO World Heritage is located in the Ninh Binh province. It is still much less touristy compared to Halong Bay but it’s sad that so many people skip it. 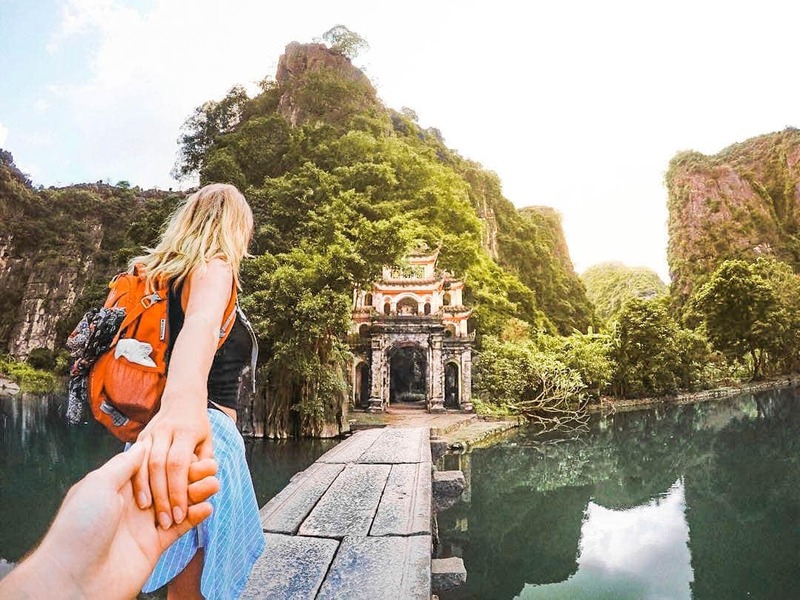 Head out to Tam Coc village as early as possible to get it all for yourself. The boat tour at Tam Coc is really different from Halong Bay. You will get your own private boat with a local lady that paddles with her feet, yes her feet! 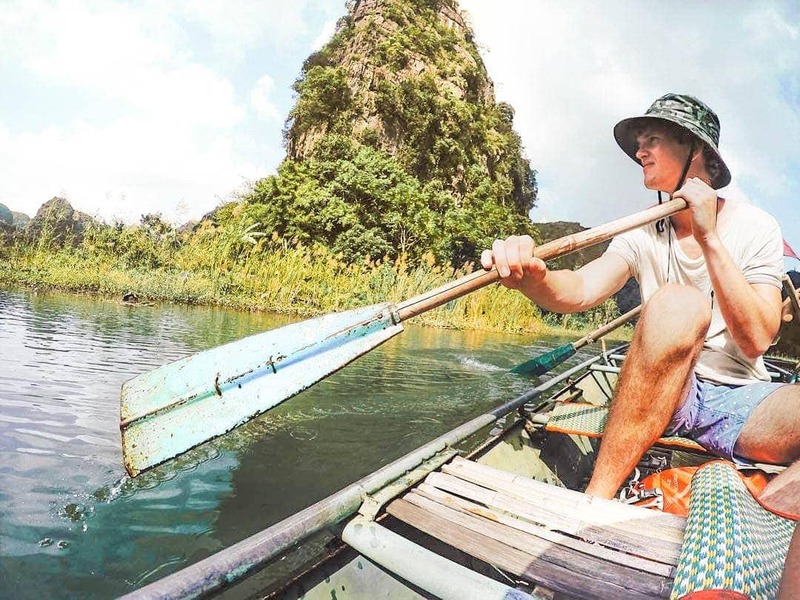 She takes you down the river along the rice paddies and through the caves. Before turning around, the lady will ask you to buy drinks or food for you or her. The price of the 1-hour tour is 120000 VDN (around $6) which is definitely worth your money! Tip: Make sure to buy a hat on a sunny day. Because it can get really hot once you’re on the river. Once you’ve visited the Tam Coc river, you shouldn’t miss the Pagoda nearby. It is built in 1428 and situated on nearby Ngu Nhac Mountain. It’s just a 10-minute drive with a motorbike. Ask people for the Bich Dong Pagoda. There’s a small fee to park your motorbike. Don’t like boats? Or would you just like to explore the area in a different way? You can easily bike around the Bich Dong area and get maybe even more impressive views. Driving a motorbike in Vietnam is known as dangerous but these areas are so quiet that you shouldn’t worry about that! From Hanoi, it’s a two-hour drive to Tam Coc. 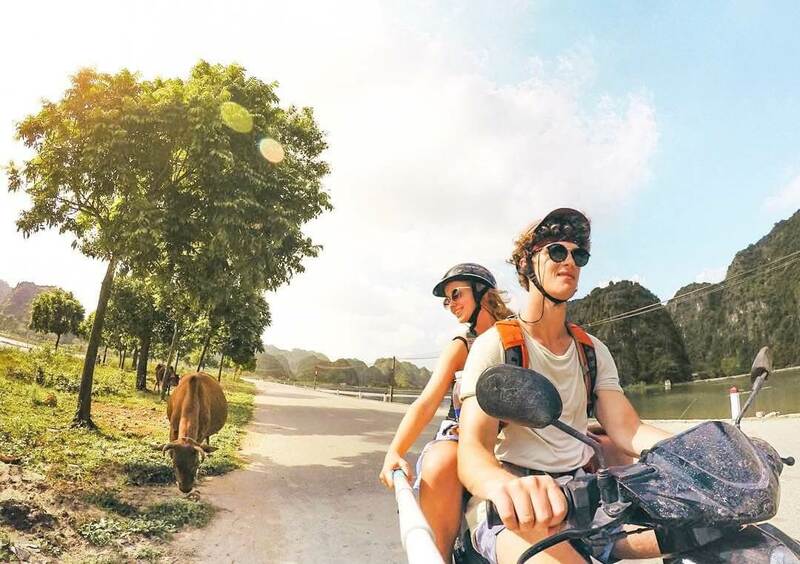 You can also do a perfect cheap tour in Halong Bay and take the bus from the beautiful island Cat Ba to Tam Coc or Ninh Binh. Ninh Binh is next to Tam Coc and is a 3-hour drive from Cat Ba Island. There isn’t much going on in Ninh Binh town but there is one amazing restaurant, Trung Tuyet. It is a small and simple place run by a sweet family. The chicken of beef pineapple dishes are the ones you’ve never tasted before! When you ask for the bill the waitress will ask you if it is your last night in Ninh Binh. When it is, you’ll get a bag with some snacks. Pretty random but so nice. ? Conclusion: this is the best restaurant we’ve eaten in two months of Vietnam! It’s best to stay in Tam Coc or Ninh Binh, which is nearby. These beautiful bungalow are located on the river!! Staying at people's home is a unique experience. Near the river. Stay cheap and feel totally at home! Just for $15 at home. This is a more luxury stay in Ninh Binh. Starting at $30 a night. The best time to visit Binh Ninh is from November to April. At this time of the year, you will experience a variety of nice temperatures and sometimes refreshing rainfall.